Dorothy was magically transported back to Kansas when she clicked the heels of her ruby slippers three times. Now you can do magic too with the help of the Dorothy and the Ruby device that performs amazing feats by clicking your heels together. 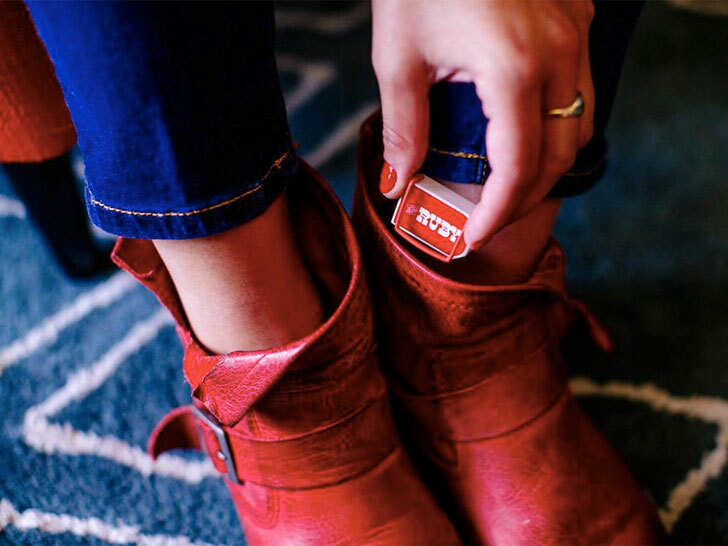 Designed by iStrategy Labs, the small Ruby device slips into your shoes, and with a heel click and you can make a phone call, text your friends or even call a cab to take you home. The GPS-enabled device can be programmed to perform If/Then actions and more importantly, be used as a discrete personal safety device in case of emergency. Whether you’re on a bad date, late to meet your friends, or need a ride in a hurry, the Dorothy is meant to help you in your time of need. With discrete clicks of your heels, Dorothy can make a bogus call to your phone to get you out of a tricky situation and it can text your friends and alert them to your location. Dorothy is paired with a small device called the Ruby, which you insert into your shoe. GPS-enabled and powered by LightBlue Bean, Ruby uses an accelerometer to detect your heel clicks. Right now, Ruby is a working prototype about the size of matchbook that slides into your shoe or onto the tongue. iStrategy Labs is working to make the device even smaller so it can integrate into your insoles or maybe even the heel of the shoe. So far the app can only make a call or send a text, but the development team is hard at work to integrate more functionality and is working with Uber to hail a ride to your exact location. Designed foremost as a personal safety device like the Cuff or Safelet, Dorothy’s If/Then programming could even be used to do things like order a pizza, call the cops, unlock your car, or turn on the lights at home. It may not be as glamorous as Dororthy’s ruby reds, byt the Ruby certainly has more functionality and can do more than get you back to Kansas.